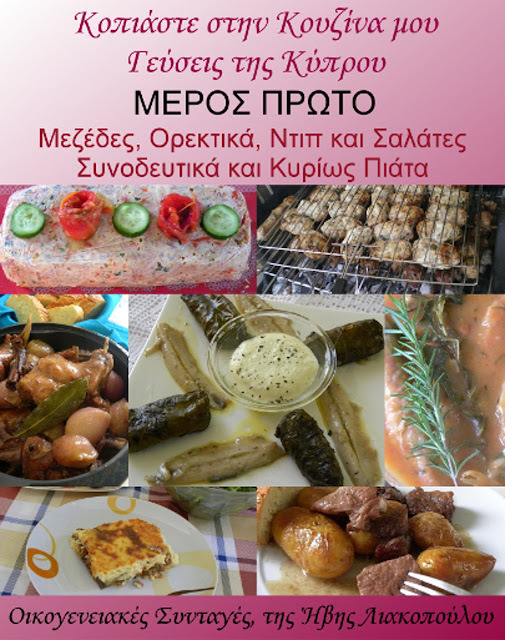 This recipe is posted especially for the “Creative Concoctions #3”, an event which is held in Kopiaste.. to Greek Hospitality. 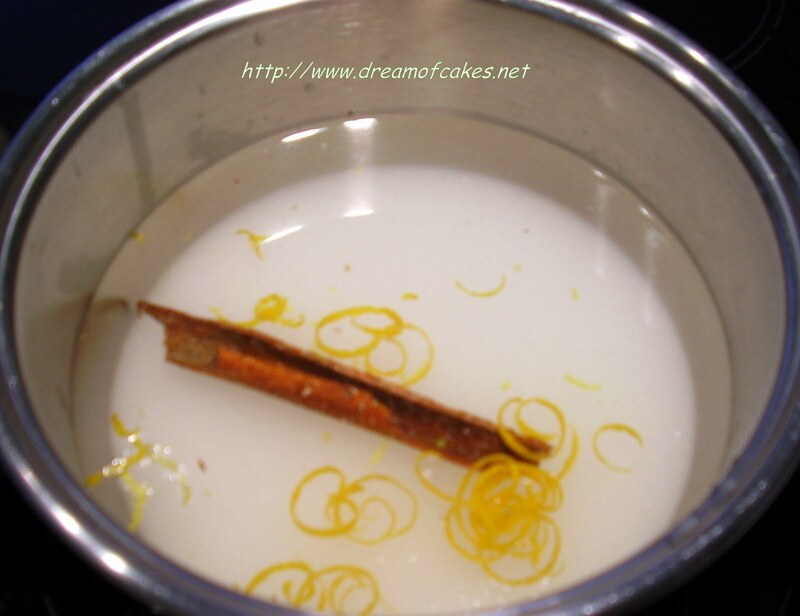 This is a traditional dessert that does not need any special kitchen equipment for its preparation. 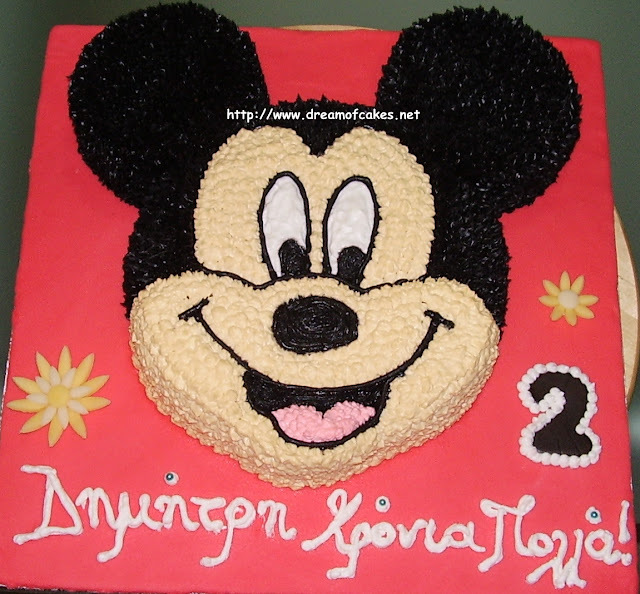 It is extremely easy to make and delicious in taste. This recipe was adopted by Συνταγές για όλα τα γούστα. 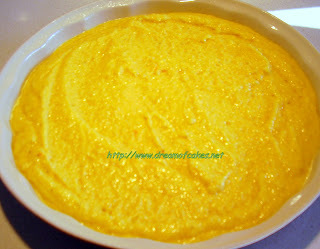 The original recipe did not include the orange zest in neither mixture nor syrup. 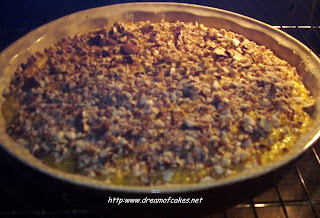 But believe me, by adding orange zest you will give this sweet an extraordinary amazing smell. 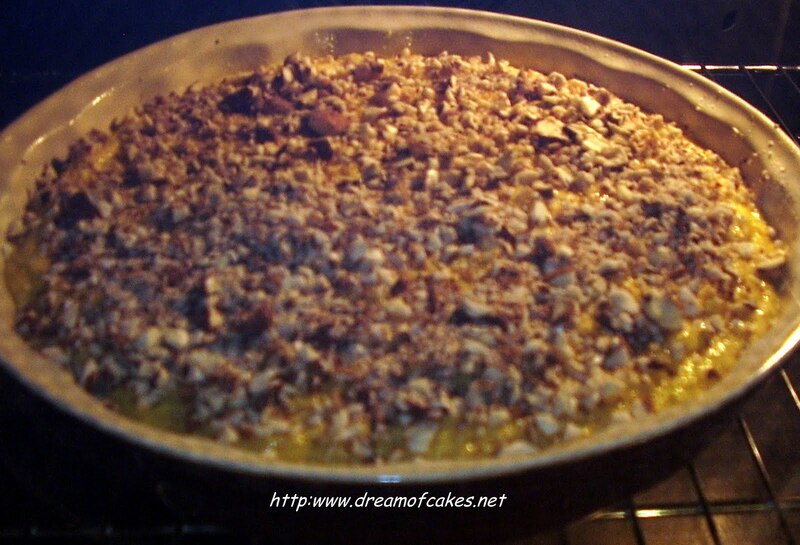 The other change that I made was the addition of the crashed almonds on top of the sweet before baking it. We all found this addition very nice as well, but you can omit that if you like. Below you can find all steps of the recipe. I hope you enjoy...! 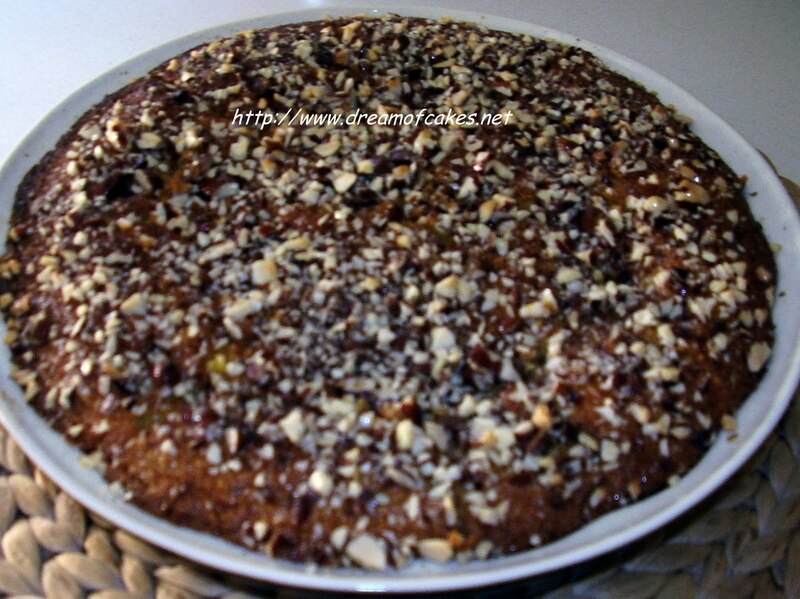 Shiamali Ingredients: 2 cups of fine semolina, 200gr Greek yogurt, 1/3 cup caster sugar, ½ cup vegetable oil, 2 small eggs, 1½ tsp Baking Powder, 1 vanilla sugar, 2 tbls orange blossom water, ¼ tsp of mastic powder, 1 tsp of orange zest, ½ cup almonds (crashed). Syrup Ingredients: 1½ cup water, 1½ cup caster sugar, 1½ tbsp orange blossom water, 1½ cinnamon stick, 3 lemon drops, ½ tsp lemon zest, ½ tsp orange zest. Mix all syrup ingredients together in a small saucepan and allow to boil for 13- 15 minutes. 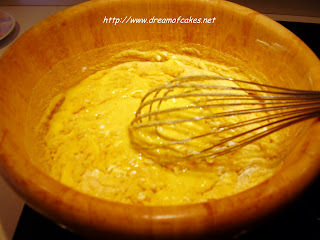 In a large bowl whisk well the eggs. 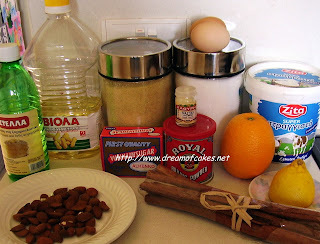 Then add the following ingredients, mixing well with a wooden spoon after each addition: sugar, vegetable oil, vanilla, mastic powder, orange blossom water, yogurt, semolina, baking powder, orange zest. Spread vegetable fat in a round Pyrex; then pour shiamali mixture in it. 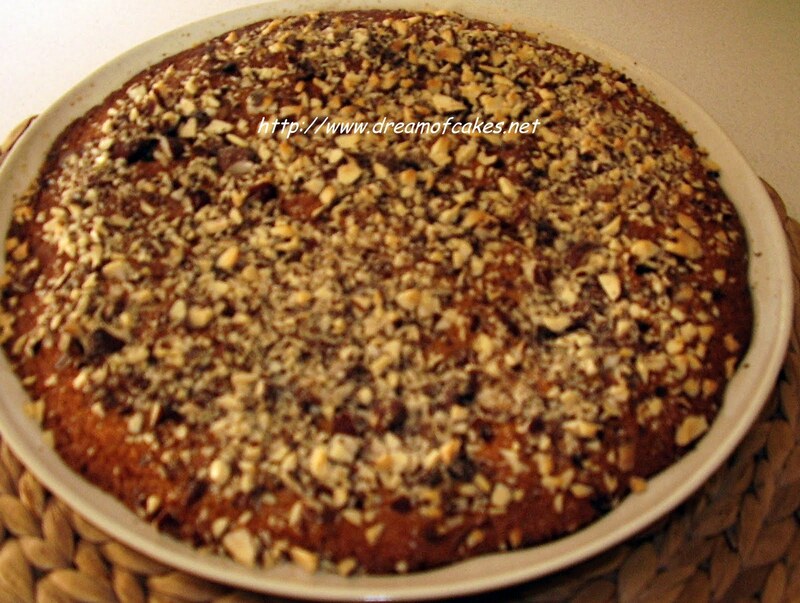 Add the crashed almonds on top of shiamali and bake. 1) Mix all syrup ingredients together in a small saucepan and allow to boil for 13- 15 minutes. Set aside and allow to cool. 2) Spread vegetable fat in a round Pyrex ; then pour shiamali mixture in it. 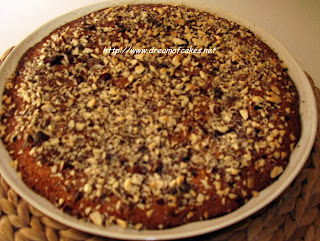 3) Add the crashed almonds on top of shiamali. 4) Bake in a preheated oven at 175ºC for 45 minutes until it becomes golden brown. 5) Remove Pyrex from the oven and cut shiamali into triangles. 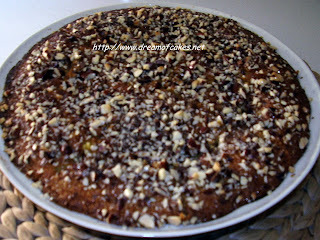 6) Pour immediately the syrup on top of the baked shiamali, before removing any piece from the Pyrex. Let aside until the syrup is well absorbed. 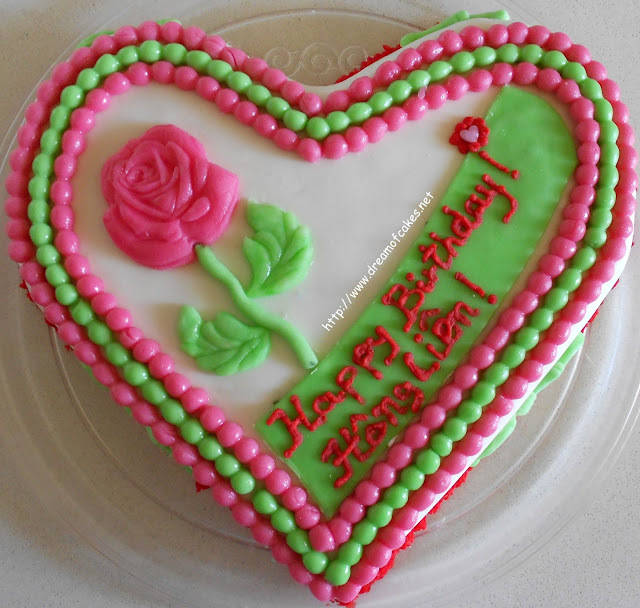 Thank you Efti for linking this delicious recipe to Creative Concoctions. It sounds delicious. Looks tasty! The crushed almonds looked like pistachios to me, which I'm sure would be great too!